Unless you are an athlete, weekend warrior or sports enthusiast, the importance of electrolytes to the body’s overall healthy functioning may not be foremost on your mind. However, the maintenance of proper electrolyte balance is not just for athletes, as all bodily cells rely on electrolytes to control cell membrane stability, hydration and pH balance regulation. Healthy individuals who are consuming an electrolyte-rich diet, as well as properly hydrating, are the most likely to maintain balanced levels of electrolytes. Electrolytes allow for cellular communication and carry the electrical charges necessary for the nerve impulses that stimulate muscle contractions, including the steady life-supportive heartbeat. Electrolytes are vital for adequate function of the nervous, cardiac, digestive and muscular systems, as well as for a stable, balanced internal environment, or homeostasis. Disturbances in electrolyte balance can interfere with bodily functions and have a harmful effect on health. Imbalances are often a result of body fluid loss, or dehydration, due to prolonged sweating, symptoms of vomiting or diarrhea, as well as certain medications. If you are an avid exerciser, get into the habit of drinking water in the hours before, during and after physical activity. To rehydrate after exercise, drink water relatively slowly. Drinking a lot of water quickly results in increased urination, which can actually slow the rehydration process. For electrolyte loss due to an acute intestinal illness, high outdoor temperature, intense exercise or strenuous physical activity, a drink containing electrolytes will help rehydrate the body more quickly than water alone. The electrolytes most important to healthy function include sodium, chloride, potassium, calcium, bicarbonate, phosphate and magnesium. These and other essential minerals dissolve in fluid and separate into positively and negatively charged ions that perform a variety of metabolic functions. Some assist in the transmission of electrical impulses along cell membranes in neurons and muscles. Others help to stabilize protein structures in enzymes. Still others aid in endocrine hormone secretion. All ions present in plasma contribute to equalizing the movement of water between cells and their environment. 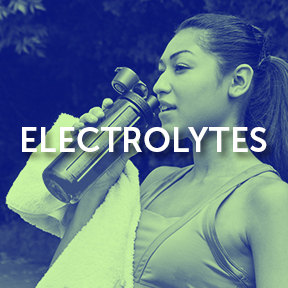 Without electrolytes, cells could not communicate or perform essential functions. Electrolyte concentrations are tightly regulated by the kidneys, which filter water and electrolytes from the blood, some of which is returned and the rest secreted in urine. Electrolyte balance whether too high or too low can result in symptoms of heart rhythm disturbances, such as an irregular or quickened heartbeat, fatigue, nausea, vomiting, muscle spasms, intestinal issues and seizures. If electrolyte balance is disturbed, disorders including high or low blood pressure can develop. Electrolyte disorders, commonly found in individuals who have abnormal kidney function, adrenal insufficiency or diabetes insipidus, require professional treatment. If you’re feeling faint after a workout, an imbalance could be the underlying cause. A well-managed diet that includes fruits and vegetables, dairy, beans and whole grain breads, as well consuming a moderate amount of an electrolyte-infused drink after exercise or physical exertion can help to limit the impact of losing electrolytes though perspiration or illness. High in potassium, coconut water is helpful as well, especially for older adults who may be taking medications that reduce potassium concentrations in the blood. To aid electrolyte balance, stay well hydrated and include foods that are good sources of electrolytes, such as watermelon, pomegranates, oranges, cucumber, tart cherries, bananas, beets, strawberries, celery, lemons and mangoes. Electrolyte/Energy Formula by Pure Encapsulations®: This hypoallergenic powdered formula provides sodium, chloride, potassium, calcium and magnesium that replenish electrolytes lost during exercise to support hydration, as well as promote stamina during strenuous or prolonged exercise. Additional ingredients include vitamin C to enhance tissue recovery and l-tyrosine to support mental focus and physical endurance. For those on the go, this formula is also available in convenient Single Serving Stick Packs. Gluten and soy free, Non-GMO vegan formulation. Ultima Replenisher™ Balanced Electrolyte Powder: Available in a variety of natural fruit flavors, this popular product provides a blend of six electrolytes and supportive minerals that work synergistically to support complete hydration without stomach upset. Free of gluten, sugar, caffeine, artificial flavors and artificial colors. Non-GMO vegan formulation. Ultima Replenisher™ Balanced Electrolyte Powder Drink Variety Stick Packs: For on-the-go hydration, these single serve stick packs contain a perfect balance of six electrolytes plus synergistic minerals to support optimal hydration. Pack contains 20 sticks of assorted natural fruit flavors. Free of gluten, sugar, caffeine, artificial flavors and artificial colors. Non-GMO vegan formulation. Electrolyte Synergy™ By Designs for Health®: This complete and balanced powdered electrolyte professional formula is designed to promote optimal hydration, especially after excessive perspiration. Ingredients include potassium, sodium, chloride and magnesium blended with synergistic compounds quercetin, citrus bioflavonoids and vitamin C. Natural citrus flavor, stevia sweetened. Gluten free. This entry was posted in Home and tagged Electrolyte Synergy™ by Designs for Health, Electrolyte/Energy Formula by Pure Encapsulations, electrolytes, The Importance of Electrolyte Balance, Ultima Replenisher™ Balanced Electrolyte Powder, Ultima Replenisher™ Balanced Electrolyte Powder Drink Variety Stick Packs. Bookmark the permalink.